Today I’d like to share a beautiful ship sighting from last week, while taking a 3km walk near my home along what was originally a train-line, now converted into a walking trail in the Perth hills. I always carry a pocket camera when out walking, ‘just in case’, and before setting out, wished for a clear view of a ship or two, as the walking trail has a big sky panorama, and the sky that day was completely free of clouds or chemtrails. However, 7:30 to 8am turned out to be a busy time on a track that is quiet later in the day. At that early hour it’s a thoroughfare of schoolkids on bikes, dog walkers, joggers and pre-work cyclists, all focused on doing something, getting somewhere, watching the clock. 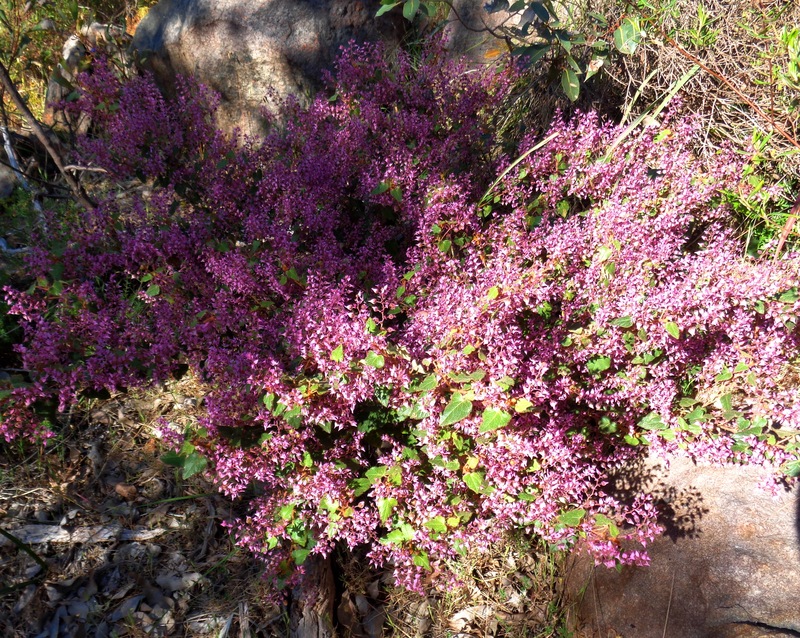 I gave up on seeing starships, and concentrated on the last of this Spring’s wildflowers, stoics still blooming after a week of temperatures over 30C, like this beautiful shrub covered in pink blossoms. Then I heard a bird call, three short notes, and recognized it as the voice of a Butcherbird which star brother Bareld Nijboer and I had ‘met’ in July (while Bareld, from the Netherlands, was visiting here). 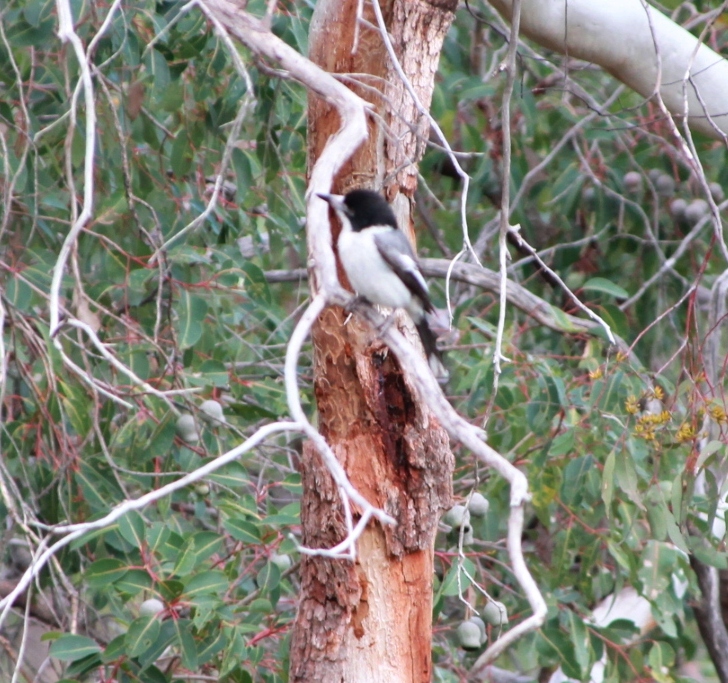 While we walked along that same trail together, the Butcherbird flew beside us, alighting in one tree, then another, along the way, singing in its beautiful and distinctive ‘tone’. Photo: Butcherbird, taken by Bareld Nijboer, July 2015. 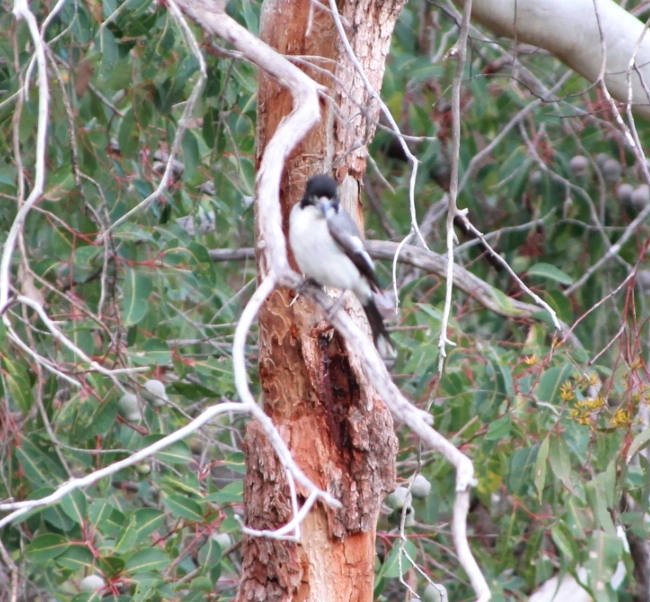 Butcherbird, by BN, July 2015. When walking along the trail these last few months, I looked out for this bird, but never saw or heard it again, until last Wednesday. On hearing its call, I looked up to see it high in the branches of a bare tree. In the moment of pointing my camera toward it, a silver ship uncloaked above the tree for two seconds, then ‘disappeared’ again. 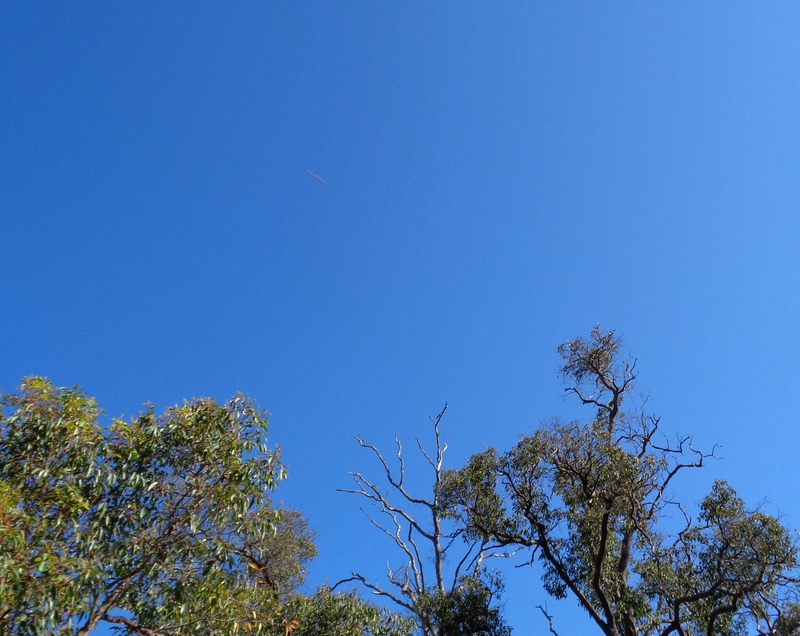 Lightship uncloaks briefly just above and left of a Butcherbird in a bare tree, Oct. 21, 2015. I only captured it in a photo because of the Butcherbird’s ‘signal’ to look up to that spot, at that precise moment, and click the camera. Without its call, I might have walked by as oblivious as the 60 or so people on the trail that morning, because my mind had already said ‘there’s too much distraction, you probably won’t see a ship now’. Disc-shaped silver ship, viewed side on, Oct. 21, 2015. This perfect signal was also demonstrating how, even if the mind is ‘fluttering’ a bit, as long as the core of your consciousness, the major part of it, is anchored in stillness and peace in your inner heart, then you can still hear the universe’s little messages – that if your mind is too busy or has ‘told a story’ that will shutter your awareness momentarily, the open heart is always ready and alert to signals given by reflection into 3D, whether it’s in the call of a bird, the shape of a cloud, a song on the radio at a precise moment, it doesn’t matter what the form is, if you’re a clear convergence point for universal Love, then Love will speak to you in whatever way will work best and to which you have an attunement, in that Now. For me on this occasion, it was so appropriate to receive a signal via a bird that had especially caught my and Bareld’s attention on our walk together in 3D. Feel the perfection at work? Ship close-up, Oct. 21, 2015. 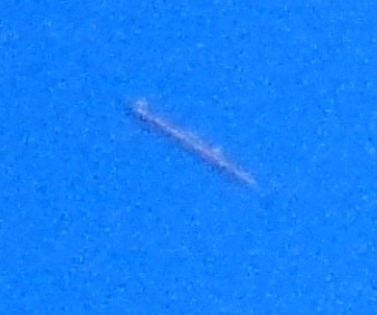 About the ship – as you can see in the close-up, the it looks long and narrow, with two rounded small objects on top of it, and a slight dome on the upper middle of the craft. 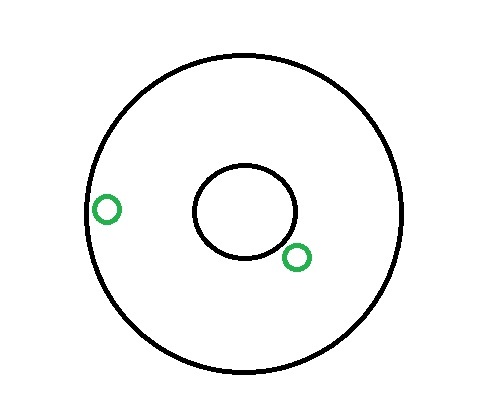 I asked about the two rounded shapes, and Ashura (my Twin Flame, known as Arnap in his 5D soul expression, captain of the Shem Arua at that time) answered, actually to view the ship in my inner vision as a disc, with a shallow dome on the top centre of it, and the two rounded shapes as the same type of little ‘pod’ craft that have flown many times close to my home. In this photo, the pods are ‘sitting’ on top of the flat part of the disc (magnetically). Ashura also stated that this ship ‘flies in the company of the Shem Arua‘. Approximation of the ship and ‘pods’ as viewed from above. You are more than a human being, much more. For within your heart is a place, a sacred place where the world can literally be remade through conscious co-creation. When you live in the sacred place within your heart, where you touch, feel and know the divine spark that you are beyond the play of forms, and let yourself fill with that spark, so that you see and feel through its Being-as-one-with-the-Whole, the veil of separation melts away. You see and feel the pure creative energy in everything – whether seemingly ‘solid’ or of more subtle flows – and the connections of everything. 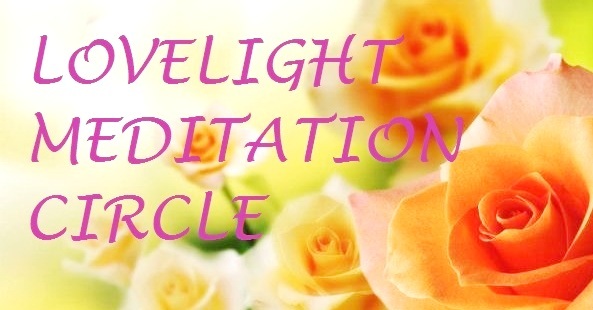 You can see and feel the qualities of the light expressing in everything around and within you. As we focus, so we become. As we emit, so we attract. Living in the heart renews our original inner sense, the wise and playful child of Source that we are. So if you find your mind ‘nudging in’ to run the show, stop and breathe, gently refocus in your heart centrepoint and…smile. Smile deeply, into your heart. Feel that smile swell in your heart, like an unstoppable wave of golden laughing light, that fills you with the Sun you are, the Star in your Heart radiating outward, to all. Love to you all, to our star brothers and sisters, inner earth families, Gaia’s elementals, the dolphin and whale beings, the Galactic Councils, and all committed to renewing Love on Earth. 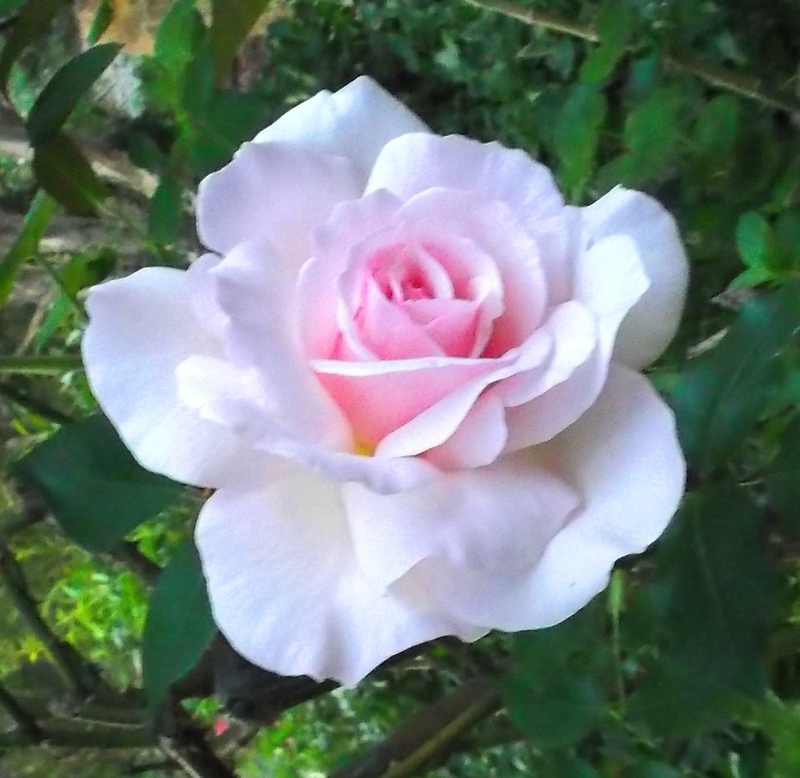 From my garden: ‘Arnap’s Rose’, white with a pink heart, the light of loyalty, love, fidelity to Source.